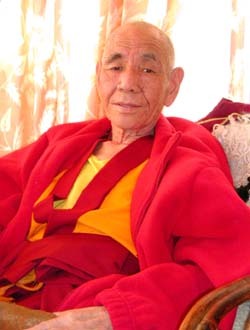 Geshe Lama Konchog. Photo by Nick Dawson. Since he was a small child, Tenzin Zopa would prefer to be with Geshe Lama Konchog in his cave rather than at his home in the nearby village of Tsum in the northeast reaches of Nepal where it borders Tibet. “Even from the time I could crawl, I would follow Geshe-la when he returned from the village to his cave. Often from early morning I would sit under his cloak as he meditated, playing or sleeping, sometimes all day. I was completely content there.” So close were they that Tenzin Zopa assumed that this meditating monk was his grandfather. Then, when the boy was seven, “Grandfather” moved down the mountain, eventually to settle at Kopan Monastery near Kathmandu. Now himself a monk of 26, having become ordained at the age of nine and spending his life serving Geshe Lama Konchog Tenzin Zopa was charged with overseeing the ceremonies and rituals at the funeral of his precious guru, who passed away at Kopan on October 15. Only now is it becoming known to the hundreds of monks, nuns and laypeople devoted to Geshe Lama Konchog, the extraordinary qualities of this modem-day Milarepa. His students have known that he meditated in caves for twenty-five years, for example, but few have been aware of the details. Over the years Tenzin Zopa has meticulously noted down the accomplishments of this great yogi, and is compiling information for a biography….